I have come a long way in my relationship with Thondekai (Tindora). Progressing in stages from being perfect strangers to distant acquaintances for years on end and out of the blue, to being very much in love now. Not a love story that I anticipated, but glad that it happened. ps: Be warned of a picture heavy post. For the first half of my life, there was little chance for me to get to know this vegetable. My grandfather’s kitchen (which I have almost always talked about on many posts) was and (still is) strictly sattvic pure vegetarian, alright. One where onions and garlic or even a mention of the duo were forbidden and quite a many vegetables welcome in everyone’s homes barred. Simply put, anything that belonged to rajasic and tamasic categories were off limits of which, Thondekai/Tindora, Nuggekai /Drumstick, Mushrooms, Radishes and Bottlegourd are a few that come to my mind as I type. It was during my engineering days, the days of living on my own for the first time that I caught a glimpse of them up close in cooked form in the hostel mess. Glimpse because, tasting was far from happening, as by then it was etched in my mind to steer clear of eating anything from the barred list, out of sheer habit. I had no regrets about it and life continued normally without Tindora for a long time. 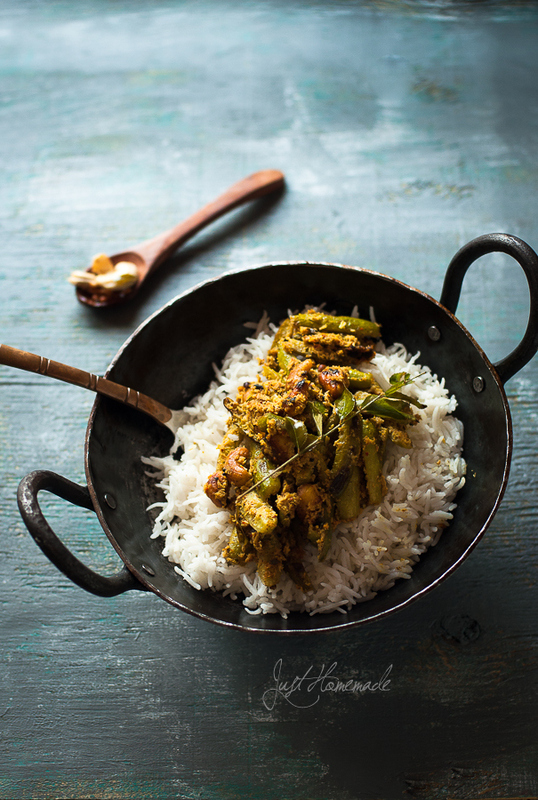 After marriage, Thondekai made a re-entry into my life through my mom-in-law’s culinary repertoire – a mouthwatering mix of traditional Andhra, Tamil, Mangalorean and North Indian cuisines and a mishmash of everything that she had made her own. 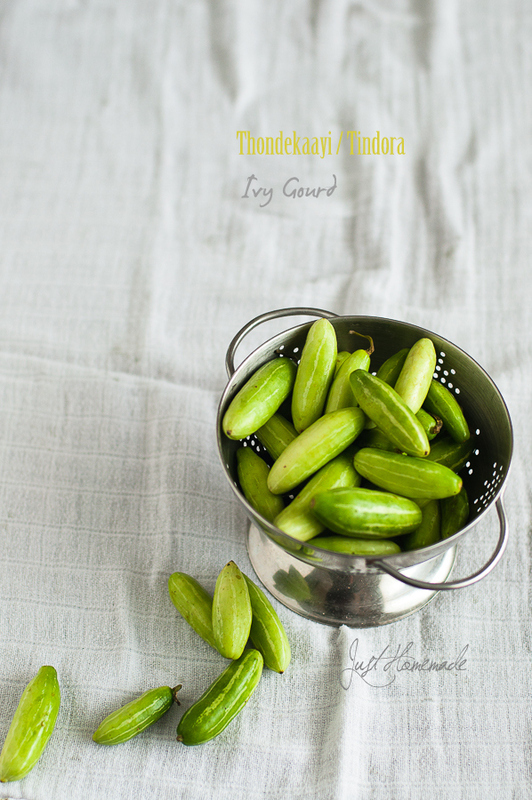 Much loved by everybody in my new home, Tindora was not just one of my Mr.K’s favorite vegetables but also a nostalgic one that transported him to his childhood days of growing up in Mangalore. Knowing that and even after having tasted Thondekai in different dishes, it never quite entered my kitchen for years. A couple of years back, I found a plastic bag filled with miniature cucumber lookalikes in the refrigerator one morning while digging up vegetables for the day’s menu. Over the years, I knew that if a particular vegetable appeared in the refrigerator without my involvement, it was Mr. K’s way of non-verbally hinting at a favorite dish he had been craving to eat. To not complain is a virtue that honestly I feel lack terribly. The opposite is true however with Mr.K. So, the last thing I wanted to do is throw an excuse with my lack of experience in cooking with it. Instead, I started devising delicious plans in my mind. This recipe has been a favorite of ours for as long as I can remember. So, I played around with this safe recipe featuring Thondekai and whole cashews as the main characters. It surprised me like a bollywood small budget super hit movie cast with debutante hero and heroine, as if it was beginner’s luck! Each morsel is a sensory roller coaster – curvy whole golden cashews beautifully contrasting the crunchy slender Tindora quarters smothered in a masala paste of fiery red chillies and pungent raw mustard seeds mellowed by the sweetness of freshly grated coconut, spiked with the tartness of tamarind, resplendent with shades of yellow from the turmeric and ground mustard and their earthy scents complementing each other like a lovelorn young couple. One a tangential note, I believe in the ayurvedic way of cooking and eating right for one’s body type and care about well being of the mind-body-spirit and aware of the ill effects of tamasic and rajasic foods on these aspects. In this day and age, however hard we try, our lifestyles are woven in such a way that we eat far more tamasic food than we might realize be it pizza at a birthday party or samosa at a get together (who knows how old the oil was or if it was frozen and re-fried) or cakes and pastries laden with preservatives, to name a few. In comparison, Tindora might be less tamasic after all when cooked fresh and consumed at home. There might come a day when I move away completely from all of those including Tindora. But for now, here is this punch of a recipe. Wash, towel dry, remove ends and slit Thondekai/Tindora into lengthwise quarters. While cutting, discard any that are light to fiery orange which means they are tough, ripe and tart. To cook basmati rice - Wash the rice couple of times, strain the water and let sit for 20 mins. Heat ghee or oil in a heavy bottom pan. Add rice and stir until the grains are opaque for about 5 mins. Add about 3 cups of water (I prefer hot water to hasten cooking) and let it come to a rolling boil and cook till 3/4th of the water has been absorbed. Turn down the heat to simmer and cook covered until rice is soft and grains are separate for about 10 mins. (should not be mushy). Meanwhile, in a blender, grind the “to grind” ingredients along with 1/4 cup of water (more if required) to a smooth paste and keep aside. For the tempering, heat oil in a medium-large kadai / sauté pan over high heat. When the oil is hot and shimmering, add mustard seeds. 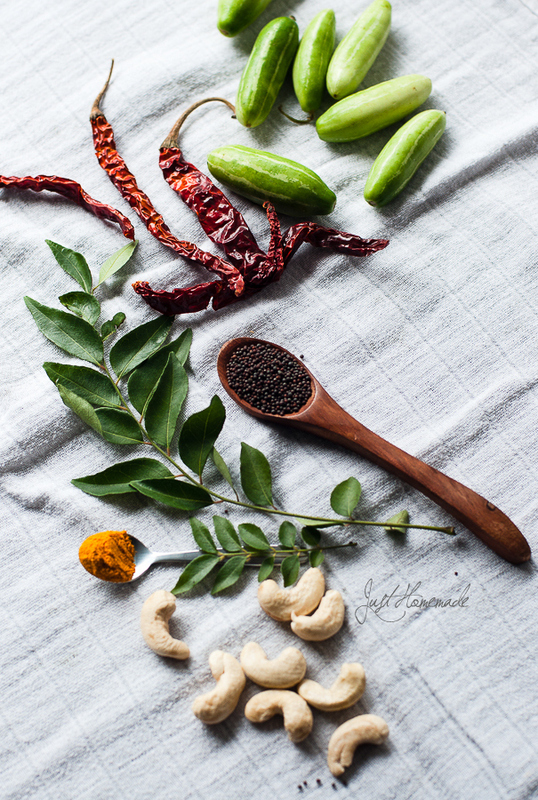 When they start to splutter, reduce the heat to medium and add hing quickly followed by whole cashews, urad dal, red chillies and curry leaves and sauté until the cashews and lentils are golden brown, curry leaves are crisp and chillies are browned as well. Add turmeric and tindora quarters and give it a good stir. Add salt, sprinkle some water and cook covered on medium heat until tender (cuts with a spoon). Now add the ground paste, adjust salt if required and sauté until the sizzling stops and oil separates, about 10 mins. Switch off and keep aside. Fluff the rice with a fork and transfer to a large mixing bowl to cool. Sprinkle salt (for the rice only) and mix well. Add the curried vegetables mix well, gently folding the rice from side to side to keep the grains separate. Let the mixed rice sit for 15 mins for the spices to settle before serving. Select tender tindora which are smaller in size and have a nice shine avoiding the big ones even though they look tempting, as they are mature and tough. If you still do, you’ll learn which ones are to discard when they hit the cutting board. Thondekaye is hands down my favourite vegetable. 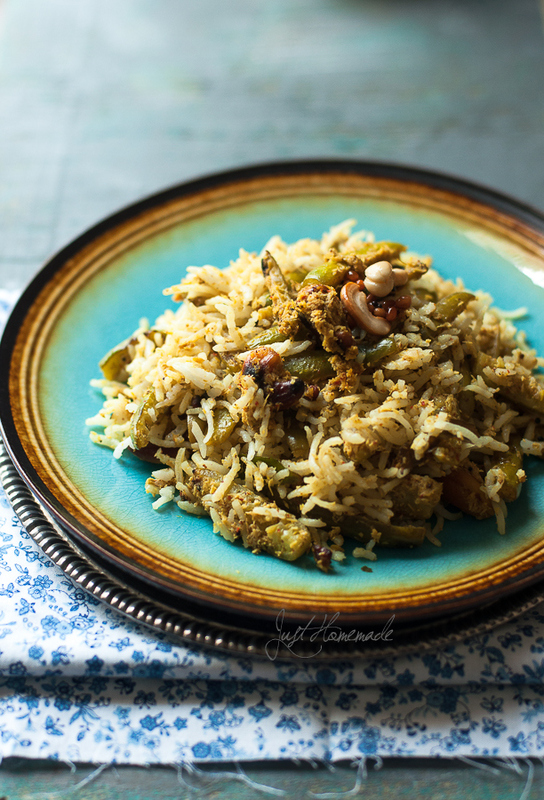 So much so that my visits to India are usually punctuated my various Thondekaye dishes made by aunts, as I have made my love for it well known. Alas in Australia we don’t have access to the fresh vegetable and must settle for the frozen version with all its inadequacies. I will be trying out this recipe though, even if it means snipping open a packet from a freezer! Gorgeous post! 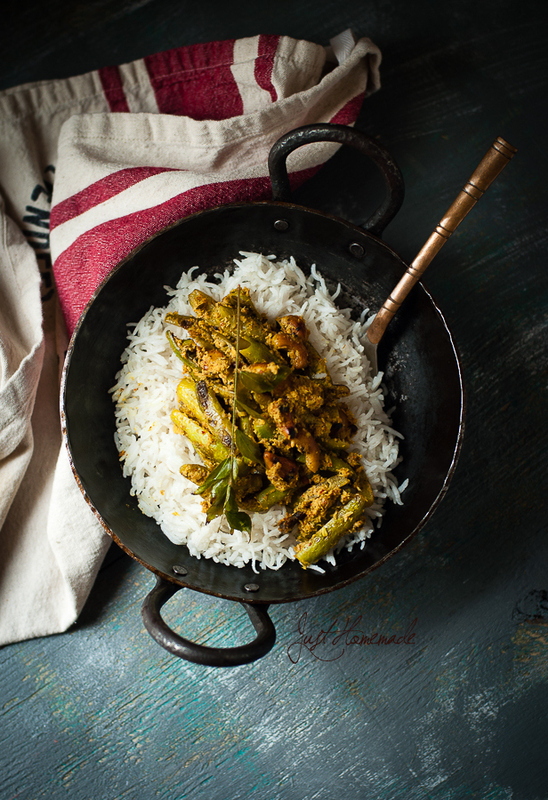 Deepa, Thats a story all of us outside our home country can totally relate to.. Hope this recipe tickles your tastebuds and satisfies your Thondekai cravings even just a little bit! Aruna: Thank you. I hope you do try and let me know how you like it! Yes, that was four years back.. Helene is immensely talented as well as meticulous in method and her book is so helpful. Right, Reminds me of my Taatha’s house. Awesome.. I’m loving your site.. Super helpful and informative.. Thanks.